Post subject: Early screenshots location? Remember these early screenshots, some even in hi-res? I'm still wondering where it may be from. Some version of Pine Valley? Of Ascent? A custom level like the one for the "VIEW" building? I'm gonna say some early small test level like the "view" building one, as you can see where the terrain ends. In some ways these remind me of the gorge in Ascent 2, maybe there's a connection. I thought those were Pine Valley shots? I agree with tatu, it seems these are just small areas of terrain that were never really full levels. Been wondering about these for a long time, too. It's also worth noting that none of the objects seen in these images are present anywhere in the game, in any version. The only recognizable thing is the ground textures. The terrain also looks much better detailed than it ever does in Tres, so that adds to my conclusion that these are just early 3DS Max renders in a level that never was in the game. Personally, the ravine running through the center of the map reminds me a lot of IJ1, particularly the area where the streambed gets a lot deeper just before the Spielburg falling jeep easter egg. There's actually a few blank heightmaps for other levels in addition to the ones with actual data. Perhaps it was one of those test levels. You know who might remember? Seamus Blackley. Personally... I think those images go with the Tres dev's frequent use of PV content, for promotional purposes. Yeah, but they had to make the terrain to take the screenshots, (even in 3DS Max) this same area also appears in the pre-rendered trailer breifly. Just found these in Tatu's image collection. Notice the similarities in the seconded image to the ones machf posted. 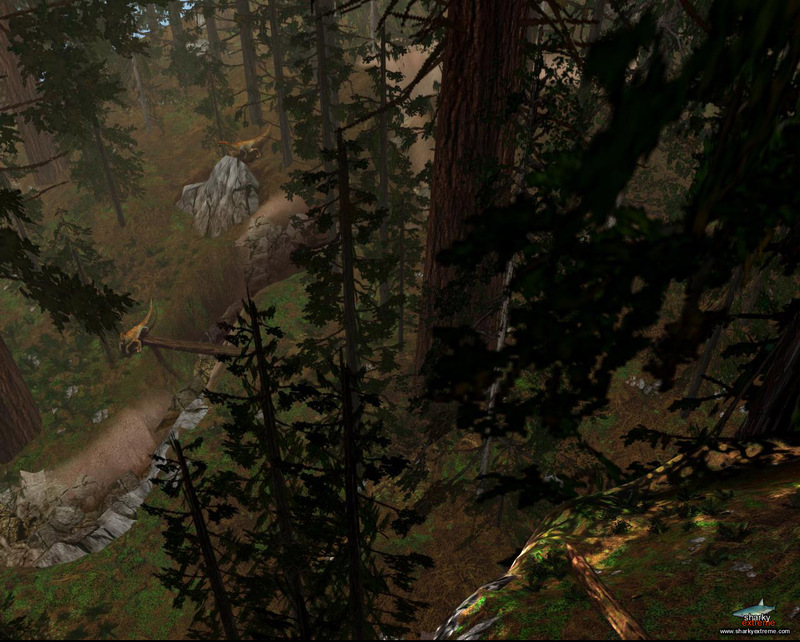 Just took a look at the trespasser trailer on YouTube and I was right the image with the gorge is in the trailer. Looking at the walkthrough for PV the beginning has a number of gorge/dried river puzzles. If this is connected to PV it was probably cut because they had issues with the Albertosaurus ending up in the gorge thus ruining the chase. below is an excerpt from Philip Salas about PV. and a very hungry T-REX. see it in the released version of the game. Hmmm. Do we know, which dev created the Trespasser Demo? 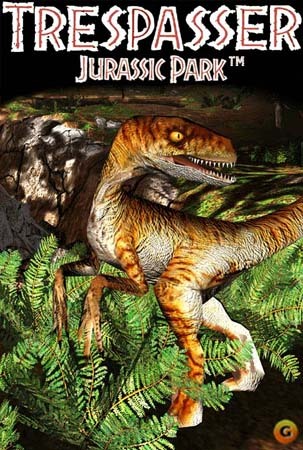 Lately I've been looking at the various versions of "raptor valley" and I believe I've found a slim match to the forest_.gif. In build 55 the valley aceands up, over by 1032,558,126 the terrain dips down before becoming a low ridge. 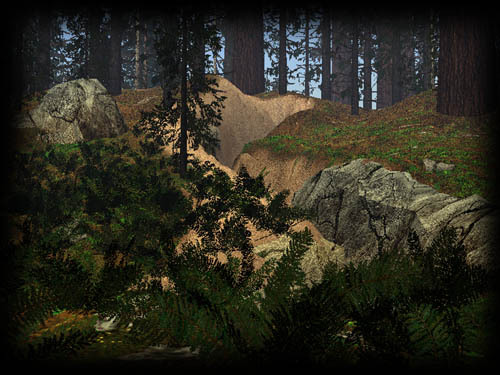 Now in the forest_.gif we see a flat section of land with a low ridge at the end, thoughts? Oooo, I hadn't investigated PV b55 beyond a brief analysis of the proto terrain to the north of the geo plant, it's... both interesting and quite empty. The terrain in older builds says a lot about how the devs altered things to be more playable. The spot you indicate seems as good a place as any along the North boarder of the valley proper. I will point out that over time it's become clear that images from around that time in development seem to be made using mini "display-only" levels such as the one found in the Tres source. At any rate, a favorite image of mine; certain trees in town often remind me of it. yay for my project I was having a tough time getting the feel for what the terrain should be. In 55 it goes up that rise but in 96 it's clearly been hastily altered, not to mention the path going up the sides of the hill. And don't get me started on the raptor nest terrain . I will point out that over time it's become clear that images from around that time in development seem to be made using mini "display-only" levels such as the one found in the Tres source. At any rate, a favorite image of mine; certain trees in town often remind me of it. The Rex Shack was definitely one of the mini-scenes, rather than an imgame location. The Tar Pit probably was, though may actually have been an area in PV near the plant. Not sure which raptor gorge you're referring to. The View Building, likewise a mini-scene, sadly. Why go to the trouble - to build up interest for the game while the actual levels were still WIP. Simultaneously, they were obviously meant to convey the visions they had at that time for the final product, and used the versions of would-be assets they had at that time. Not quite sure where the Rex Shack was intended to go... Possibly something a dev whipped up when asked to put together something interesting for the public to look at.